The sport of bowls has been introduced at a school in Bristol in a bid to help students "de-stress" ahead of exams. The new after-school club has attracted students from across year groups. Steve Priday, head of citizenship, said: "I wanted to try something new, low-cost but with high skill levels and bowls has suited the brief entirely." The secondary school has just under 1,000 pupils aged between 11 and 16 and offers after-school clubs including judo, streetdance and cheerleading. Despite its reputation for being a sedate pastime for older people, students have described short-mat bowls as being "really good fun". "In the run-up to exams it is a great way to de-stress," said Mr Priday. 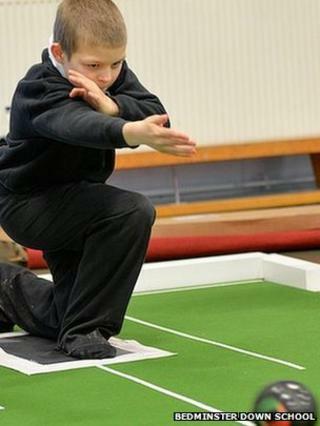 "Now I'd love to find some other schools offering bowls so we could start competitions."